This book introduces the Map of Meaning which provides a clear, simple and profound framework of the dimensions and process of living and working meaningfully. The Map of Meaning is based on over 20 years' research into the insights and practice of ordinary people as they search for, lose and find meaning. Incorporating the ideas of philosophers, psychologists and sociologists, this book describes how human beings wrestle with, and answer, questions such as, "What gives my life and work meaning? ", "How can I balance inspiration and reality and maintain positive momentum?" and "How do we integrate meaningfulness into our workplaces?". Innate human knowledge is captured in a practical model that makes understanding and working with issues of meaning clear and accessible to everyone. At an individual level this book helps people to define and stay in contact with what is most important to them as they grapple with the real problems of daily life. It shows how they can stay in charge of keeping the human search for meaning alive, especially in the face of the challenges that exist in organizational life. Because the dimensions of meaning are shared, the second half of the book focuses on how we can bring an awareness of what creates meaningful work into our thinking about the practice and design of organisations. The authors recognize that in the current economic context a simple, yet profound guide for humanity is essential, precisely because organizational life has become so intensely directed towards a singular economic goal. They argue that it is vital that people have an easy, powerful way to reclaim the significance of meaning in their working lives both individually and at a whole of organization level. Updated with new chapter material and case studies, this second edition offers profound insights for anyone who is interested in creating more meaning and purpose in work and organizations – from a CEO to a blue-collar worker or consultant. It is for those searching for ways to re-energize their roles or change their careers. It is for anyone who firmly believes that it must be possible to align our deeper life purposes with our daily actions in the workplace. It is for anyone who is committed to creating workplaces that support and enable the experience of work that feels worth doing. "When we are lost we become desperate for guidance. Today we are all lost. In this thoughtful volume, the authors give us a precious gift, a map to meaning. It is a gift to be cherished". "I read this book and did all the exercises in it. The book contains an indispensable tool to keep us whole. It will save us from burnout; it will save us from cynicism. It's totally non-judgemental. It's like a key that unlocks all that is important to us as human beings. As a consultant working in developed and developing countries, this framework gives me a simple way to profoundly engage with people across cultures. I can see for the first time not only myself but the context in which I live my life." 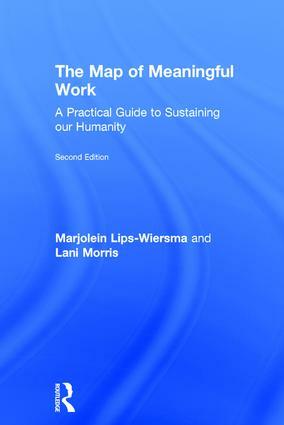 "Lips-Wiersma and Morris bring the meaning we make of life to a whole new level of understanding in their book, The Map of Meaning. They offer their holistic developmental model as an analytical and practical tool for engaging different pathways of meaning-making in our work and in our lives more generally. The book is overflowing with useful advice and examples of how to engage the model as a means for fostering individual and collective growth, learning and re-becoming whole." "I read this book with great delight. It is an important book, as it helps people orientate their career and work life balance in line with their values and beliefs. It is a rigorous book, thoroughly researched and evidence-based, tried out and tested in various organisational sectors, in different countries and with a range of professions. It is also a dangerous book, as it confronts readers with their inner most sense of being and challenges them to an intimate conversation with their self. The human resource professional who wishes to work with human beings, rather than with human resources, will find in this book a useful and easily accessible tool, with numerous illustrations, to help people on their career journeys inside and outside work. It is very well written and deserves a good reception. Highly recommended." Chapter 2: What is the Map of Meaning and How was it Created? Marjolein Lips-Wiersma is Professor of Ethics and Sustainability Leadership at the Auckland University of Technology, New Zealand. She has been a board director, chair of the Management, Spirituality and Religion group of the Academy of Management, and regularly works with individuals, groups and organisations to create meaningful work practices. Lani Morris has over 30 years’ experience of working as an independent organisational behaviour practitioner with organisations and individuals in New Zealand, Australia and the United Kingdom and as a visiting lecturer at a number of universities and tertiary institutions. She has a BA in the humanities, and an MSc in Responsibility and Business Practice from the University of Bath.